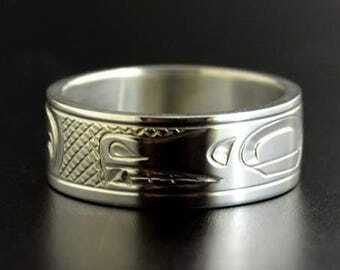 Announcement Hand-Made Northwest Coast Native First Nations Items from Vancouver, Canada. Hand-Made Northwest Coast Native First Nations Items from Vancouver, Canada. 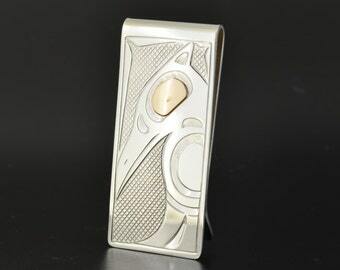 Northwest Native American Sterling Silver and 14k Gold Native Moneyclip Billfold 2" x 1"
I love the ring! It is very nice and fits perfectly. I feel proud to have a piece that honors my ancestors. Thank you very much. So happy and pleased ! I love it !! Each item in our shop is hand-engraved using steel gravers. This is a laborious process, so we advise getting your Christmas orders in ASAP to ensure they arrive in time. 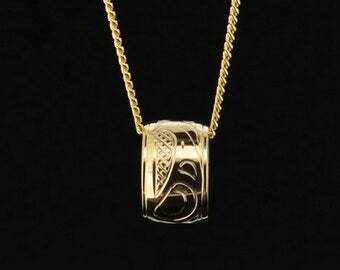 A pendant on the engraving block. The design has been drawn, which is the easy part...now it has to be hand-engraved! Initial incising is complete for this silver-on-silver overlay cuff. Let the cut-outs begin. We accept commissions. These link bracelets were ordered with abalone and turquoise. Justin Rivard‘s first few years were spent learning the complex Northwest Coast aesthetic through trips to the library. 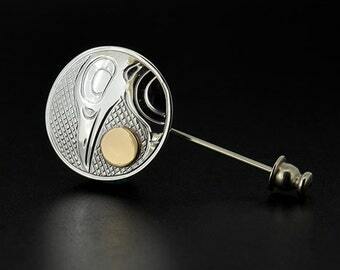 It was not until 2001 that Justin became a full-time jeweller, after the demand for his work became so great that there was simply not enough time left for a day job. 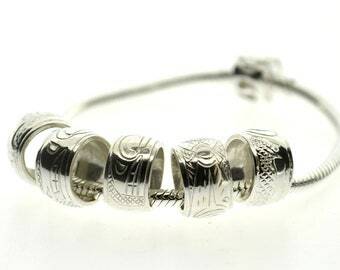 He spent much of the nineties honing his craft, focusing on jewellery-making, and working in B.C. art galleries in an attempt to understand the ins-and-outs of the art world: "My style is a combination of influences. I was born and have lived my whole life on the west coast of British Columbia, but my Native ancestry is Cree. I fluctuate between West Coast and Plains styles. Each offers its own unique quality, stories, and history, and it’s impossible for me to limit myself to just one type of design." 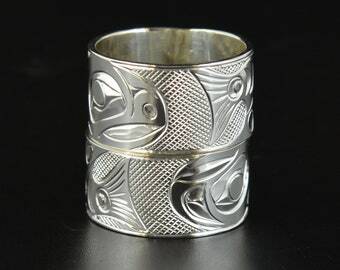 Justin is an Indigenous jeweler who trained with Kwakwaka'wakw artist Ray Dumont for 16 years and has work in Canadian, American and Scottish galleries. 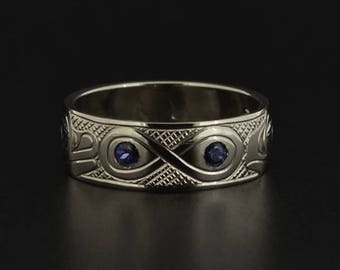 Hailing from Nanaimo, he has been creating hand-engraved jewelry for over 20 years. Alex manages this Etsy shop and assists with custom requests, packaging, and shipping. He holds a BA and MA in Northwest Coast Native Art. Returns are not accepted, but exchanges may be considered. Seller is not responsible for damage during shipping. For custom orders and custom labor, no refunds can be given due to the impossibility of resale. Standard airmail is the default shipping method for this shop. Standard airmail does not come with a tracking number, and the seller is not responsible for any lost mail lacking a tracking number as long as proof of shipment is provided to Etsy and the buyer. Please contact the seller before making a purchase to request traceable shipping.